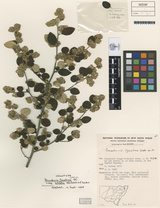 Description: Shrub 1–2 m high, stems rusty with long spreading simple hairs and a short stellate-tomentum. 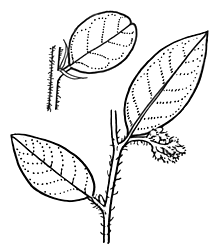 Leaves mostly lanceolate to narrow-elliptic, rarely ovate to ± circular, 2–8 cm long, 10–20 mm wide, margins recurved; upper surface glabrous, secondary veins regularly arranged; lower surface silky, rusty simple hairs usually obscuring secondary and tertiary veins; stipules lanceolate, 5–7 mm long, shed early. Flowers yellow, in loose terminal panicles, covered with long whitish hairs. Petals absent. Capsule and hypanthium with long silvery hairs. Distribution and occurrence: Rare on the north coast and ranges from Woodenbong to east of Guyra.